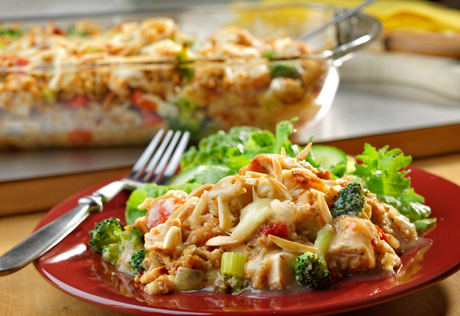 Stir the stuffing, turkey, broccoli and tomatoes in a large bowl. Stir in 1 cup gravy. Spoon the stuffing mixture into an 11x8x2-inch baking dish. Stir the remaining gravy and wine in a medium bowl. Pour over the stuffing mixture. Sprinkle with the almonds and cheese. Bake for 35 minutes or until the stuffing mixture is hot and the cheese is melted.